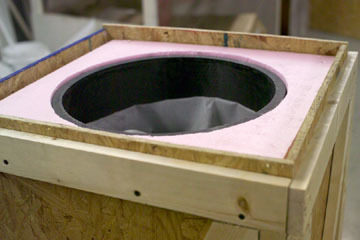 The tube's wall thickness is 0.7"/17.5mm (5/8" thick honeycomb core). Tube length: 47.75"/1212.9mm. 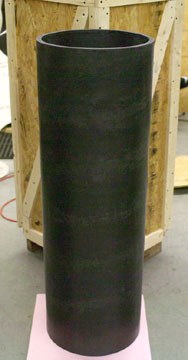 Tube weight: 12 lbs/5.5 kgs. Your tube has arrived today and shortly, I can only say: WOW, unbelievable! Tube is very precisely done, internal and external surfaces are perfect, the tube itself is extremely lightweight, and firm! And one important thing. You did it so precisely, that I have absolutely no problem to use my Parallax 16" rings without any modification! So, what else could I say? Many thanks for so precise and lightweight piece of art. If someone still has some doubt whether to use your tubes or not, simply give him my address as a reference. Czech Republic - www.asu.cas.cz "
The tube inside its shipping crate. 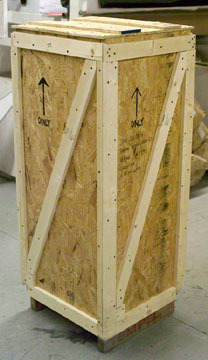 2" thick foam keeps the tube centered in the crate and protects the tube during its international (Switzerland) journey (shipped 12/1/06). 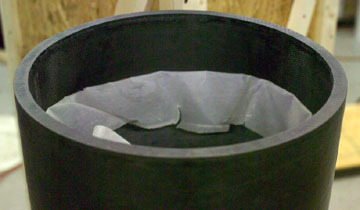 The white fabric on the inside of the tube wall is peel ply. It is being left on to keep the interior clean until the customer is ready to paint. 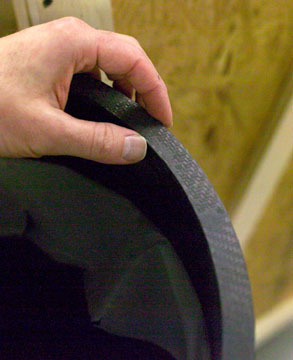 Peel ply leaves a finely textured surface that is ready for secondary bonding and/or paint.